Bringing you beauty news from inside and outside the Big Brother house! Every Big Brother season so far has seen housemates enter as slim, toned contestants who then gradually pile on the pounds during their stay in the house. Many of the girls throughout the years have ended up squeezing their larger than normal assets into special eviction night outfits. It happened to the best of them - Helen, Jade Goody, Kate and even last year's winner Sophie. Now the weight-gate has opened again for the latest housemates! It all started with an offhand comment made by Minister Dave to Josie. Hardly a vision of health himself, Dave suggested Josie join him and Caoimhe in their new exercise routine - big mistake! The suggestion that Josie needs to shed a few pounds left the Bristolian lass reeling for most of the morning! With all the bad food being consumed and lack of exercise going on in the house it is no wonder that housemates are gaining some extra chins! Dave and Caiomhe are obviously trying to combat their fat fate by embarking on an intense exercise regime - I wonder how long that will last? Ben gets the full works! Ben has had a week packed full of beauty treatments and pampering, which is pretty impressive seeing as its only Wednesday!! Complaining he looked like an old lady, Ben was obviously getting fed up with his out of control hair so booked in with fellow housemate Mario to get the chop! So protective over his luscious golden locks, Ben turned down Corin's offer to help revealing that he trusts Mario much more. Mario must have been feeling the pressure because (I don't know about the rest of you) but I can't see much difference in Ben's hair?! Closely following his hair appointment with Mario, Ben and his rejuvenated bouffant got involved with some more bathroom pampering. Muscling in on the girl's beauty session, Ben took full advantage of Rachel's pampering skills and enjoyed a relaxing facial from his fellow housemate. The treatment included the full works with a green face mask, eye coolants and, best of all, a pink hair net - and Ben was worried that his hair made him look an old lady? What's next Ben - a blue rinse and rollers? Cor blimey! Things have hotted up in the house since the arrival of our new female contestants. Just as our original housemates were getting a tad complacent with their looks, with the exception of Ben of course, it seems the entrance of the two attractive girls has caused the house beauty regimes to have sky rocketed! Although probably not how you would have expected! Instead of seeing the original girls (who look like they gave up on makeup and skin care a few weeks back) get preening to fight off potential competition it has been the boys who have been influenced by the new high maintenance looks. Today we spied Dave raiding his fellow female housemates' make up bags to give himself a bizarre makeover, transforming him from minister to mistress! Even Ben was impressed with the handiwork, commenting on how well Dave could pull off the ladylike look! Rather than go for a subtle natural style Dave opted for full on green eye shadow, glitter, blusher and pink lipstick. Slightly too 80’s in my opinion but what are your thoughts? Is Dave’s transformation an improvement or should he go back to the manly minister look?! The mono-brow has left the building! The pretty boy vs bad boy debate has been well and truly answered. Nathan was booted out after a whopping 89% of the public voted for him over John James. Now we'll never know if Corin would have got her razor on that mammoth brow of his! One thing last night proved was that John James' blonde hair and blue eyes have not only wooed Josie, but the whole of the UK. Once and for all, solving the pretty boy vs bad boy quandary. No sooner had the hairy bad boy left, three more housemates landed, literally! I can't wait to see the trouble these new contestants will stir up, there's bound to be some rivalry between blonde bombshells Keeley and Josie while Ben is sure to up his makeup and beauty game with the arrival of two more pretty girls! I'm hoping Ben might share some of his tips with newby Andrew - who looks in need of a makeover! We had better get ready for some exciting new dramas, flirtations and beauty secrets. Don't forget to get your entries in for the Freederm competition to win tickets to the next live eviction, just give us your best pose and upload the pic! Good luck! Poor Josie was the latest housemate to fall victim to a shower of paint yesterday, following Mario and Caoimhe's near miss this morning. Josie enjoyed a marathon preening session in the bathroom, where she performed some intense pampering and grooming treatments including a bizarre shaving sesh which saw the housemate twist into some quite unique shaving positions! What is it with our housemates and their strange shaving habits this year? First Corin and her forehead, then Ben and his neck and now Josie has joined in! Josie may have more than a blue rinse to worry about after tonight. The house is set to open its doors to three new housemates, two of which are young, attractive females who are bound to cause a bit of rivalry! I'm not just talking about competition for the remaining girls but also Ben's status as Diva of the house! Watch this space. Following weeks of sporty active tasks, Ben has finally been given the task of his dreams! A hairdressing competition! The image obsessed housemate spends over an hour each morning pampering, moisturising and shaving, which even puts Corin's intense daily regime to shame! Ben has been getting bad mouthed by housemates these past few weeks due to his lack of effort in tasks; however the table turned today when Ben was faced with a hair cutting mission. The Man Versus Machine task involved a cut off between Ben and Titan as they both had to chop the most hair in 5 minutes. Not quite so delighted with the hairy challenge were Ben's fellow housemates who had to nominate themselves as models. Mario and John James in particular looked horrified at the thought of Ben coming near them with a pair of scissors! With JJ musing that he'd rather walk out than shave his head! Having already undergone a drastic change in 'do, Dave put himself and his locks forward for the chop and I have to say, Ben probably did him a favour! In the end, Ben won the task by cutting off more hair than Titan managed. Maybe Ben should let Titan have go at his hair...I'm starting to think Ben's bouffant is taking on a life of its own! Want to see the next eviction? Enter to win tickets on our competition site www.freedermbb.co.uk. With two of the best looking men in the house up for eviction, who will prevail – the rough and ready Nathan or the Beckham lookalike John James?! You couldn’t get more opposite looking men. Will Nathan win battle of the blokes with his hairy, rugged and laid back attitude towards his appearance? Or will John James triumph with his preened blonde hair and blue eyes? All the talk in the house today has been focussed on Friday’s result, the deciding factor has been put down to how many female fans the nominees have on the outside. Caoimhe is convinced that JJ is the heart throb of the house whereas Corin has backed fellow Northerner Nathan to be the most desirable housemate, commenting that "Nathan's as good-looking as John, but in a different way. If I had to go on a date with either of them it'd be Nathan, he's just more my type." The other boys in the house are just as stirred up by the shock nominations, with Mario musing that "It's the pretty boy versus the bad boy". So who goes, you decide – the pretty boy JJ or the bad boy Nathan? Which housemate floats your boat? 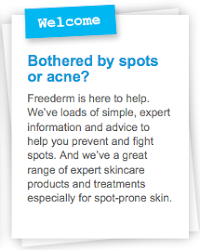 Freederm is an expert range of skincare products and treatments specially formulated for spot-prone skin. This year, we are sponsoring the final :( season of Big Brother (BB11). Read all our thoughts on the beauty and skincare regimes of the BB housemates throughout the season. Love the Freederm ads? Youtube it! 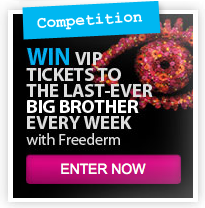 Go to Freederm's YouTube channel "BigBrother Ads" for more fun clips!